Drop the shelled broad beans into a large saucepan of boiling salted water. Return to the boil and cook rapidly for 2-3 minutes, drain and place the beans in a bowl of cold water. When cold, drain again. Remove the pale green skins from the beans and place the podded broad beans in a bowl. Combine the yoghurt, garlic and half the extra virgin olive oil. 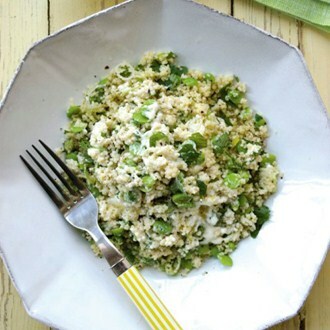 Place the couscous, spring onions and lemon zest in a large heat-proof bowl. Bring 400ml (13fl oz) of water to the boil. Pour it over the couscous, cover tightly with clingfilm and set aside for 7-10 minutes, or until the water is absorbed. Add the broad beans and yoghurt dressing to the couscous and stir through. Stir in the cumin, sumac and herbs, tossing well to fluff up the couscous. Season to taste with salt and freshly ground black pepper, and drizzle with the remaining olive oil.